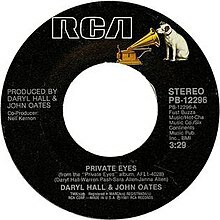 (1981) "I Can't Go for That (No Can Do)"
"Private Eyes" is a 1981 single by Daryl Hall & John Oates and the title track from their album of that year. The song was number one on the Billboard Hot 100 charts for two weeks, from November 7 through November 20, 1981. This single was the band's third of six number one hits (the first two being "Rich Girl" and "Kiss on My List"), and their second number one hit of the 1980s. It was succeeded in the number one position by Olivia Newton-John's "Physical," which was ironically succeeded by another single from Hall and Oates, "I Can't Go for That (No Can Do)". The tune for Private Eyes was written by Warren Pash and Janna Allen, with arrangement and chords by Daryl Hall. In an interview with American Songwriter, Daryl Hall states: "That's a real Janna Allen [co-writer and sister of Sara Allen] song. Janna, and I, and Warren Pash wrote that. Warren and Janna wrote most of the song, and I took it and changed it around – changed the chords. Sandy [Sara Allen] and I wrote the lyrics. It's a real family song, the Allen sisters and me." The single carries a similar rhythm to the duo's number one hit from earlier that year, "Kiss On My List," with the difference being a handclap chorus that has made the song an audience-participation favorite at live Hall and Oates shows. It was one of the duo's first songs to appear in heavy rotation on MTV. The music video featured the band dressed as stereotypical film-noir style, trenchcoat-wearing private detectives, and was the first to feature the backup band of guitarist G. E. Smith, bassist Tom "T-Bone" Wolk, drummer Mickey Curry, and saxophone/keyboardist Charles DeChant. The song is performed by Ken Marino, portraying private investigator Vinnie Van Lowe, in the Veronica Mars episode "Kanes and Abel's." The Disney Channel ran a DTV music video of the song, set mostly to clips from the Goofy cartoon short How to Be a Detective. It was made available to download on January 10, 2012, for play in Rock Band 3. American author Andrew Harmon used the song as the basis for his 2014 short story "Room 401". It has been adapted as the title theme song for the TV series Private Eyes. In 2016, Dear Rouge covered the song for the TV series Private Eyes as its theme song. Also in 2016, Lenachka covered the song. ^ Sharp, Ken (2009-01-23). "HALL AND OATES: Soul Survivors « American Songwriter". Americansongwriter.com. Retrieved 2016-10-23. ^ "Charts.nz – Daryl Hall & John Oates – Private Eyes". Top 40 Singles. Retrieved June 1, 2017. ^ "Daryl Hall & John Oates: Artist Chart History". Official Charts Company. Retrieved June 1, 2017. ^ "Daryl Hall John Oates Chart History (Hot 100)". Billboard. Retrieved June 1, 2017. ^ "Daryl Hall John Oates Chart History (Adult Contemporary)". Billboard. Retrieved March 30, 2017. ^ "Daryl Hall John Oates Chart History (Mainstream Rock)". Billboard. Retrieved March 30, 2017. ^ "Top 100 Hits of 1981/Top 100 Songs of 1981". Musicoutfitters.com. Retrieved 2016-10-23. This page was last edited on 29 March 2019, at 16:54 (UTC).